“Associate Professor of Mechanical Engineering Rahul Panat has developed a revolutionary new method of fabricating battery electrodes using Aerosol Jet 3D printing. Additive manufacturing, otherwise known as 3D printing, can be used to manufacture porous electrodes for lithium-ion batteries—but because of the nature of the manufacturing process, the design of these 3D printed electrodes is limited to just a few possible architectures. Until now, the internal geometry that produced the best porous electrodes through additive manufacturing was what’s known as an interdigitated geometry—metal prongs interlocked like the fingers of two clasped hands, with the lithium shuttling between the two sides. Rahul Panat, an associate professor of mechanical engineering at Carnegie Mellon University, and a team of researchers from Carnegie Mellon in collaboration with Jonghyun Park, assistant professor of mechanical and aerospace engineering at Missouri University of Science and Technology have developed a revolutionary new method of 3D printing battery electrodes that creates a 3D microlattice structure with controlled porosity. 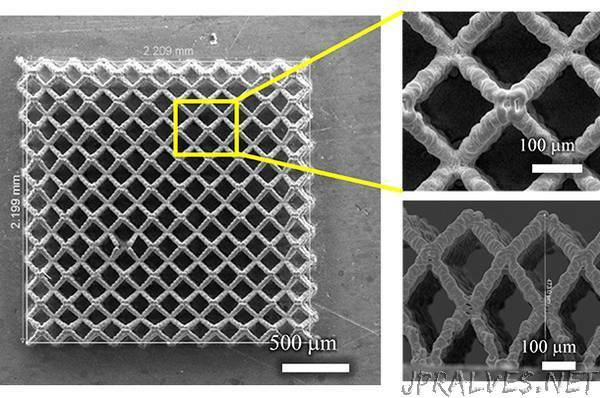 3D printing this microlattice structure, the researchers show in a paper published in the journal Additive Manufacturing, vastly improves the capacity and charge-discharge rates for lithium-ion batteries.